Sanctioned in 1997-98, the scheme assists women by providing loans through banks and other financial institutions, with subsidies given between 20- 30 per cent for Corporation's undertaking of business activities of micro enterprises. This prevents these women from taking private loans and borrowings at higher interest rates. Under the scheme, a loan of upto Rs 1 lakh is given to a beneficiary between the ages 18 to 45, having a family income of Rs 40,000 or below. Additionally, KSWDC provides a subsidy of 30 per cent for loans sanctioned to widows, the destitute, disabled women, and women from Schedule Castes or Tribes. The scheme recognises 88 different entrepreneurial activities under the scheme. KSWDC also caters to the success of women-led enterprises. 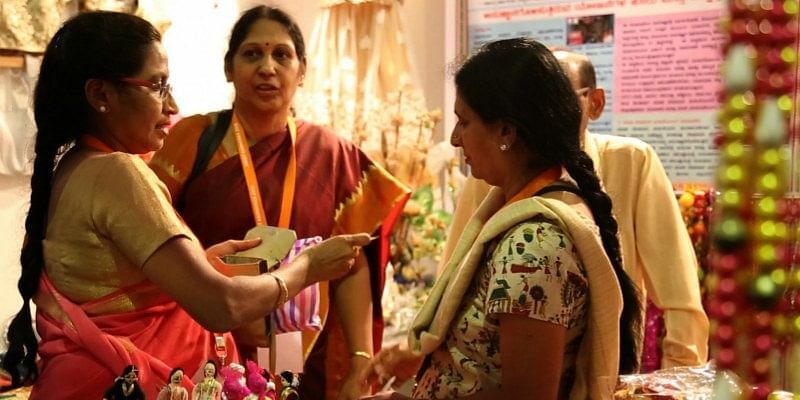 Instituted in 1997-98, the Karnataka government organises exhibitions at the district and state level to provide marketing opportunities to women entrepreneurs, by helping them sell products like garments, handicrafts, and goods. The exhibitions also result in greater sales followed by networking opportunities leading to business development. Apart from backing women, the Corporation also organises wokshops on skill training and product development followed by intense counselling. The centres where the exhibitions are held are run by an external NGO, and are operational in more than 13 districts across Karnataka. The Women's Training Programme provides skill training to needy, handicapped, and destitute women providing a stipend of Rs 300 per month for selected courses with the duration of the courses varying from one to six months. Apart from addressing the needs of underprivileged women, the Corporation also has unique schemes and programmes for social causes such as the eradication of the ‘Devdasi' system under the Devdasi Rehabilitation Programme. Introduced in 1991, KSWDC organises these women to form groups, and conduct meetings to draw mutual support, while motivating them to start savings to start anew. Additionally, there are multiple schemes for urban women entrepreneurs such as the Urban Stree Shakti Scheme and STEP. With multiple efforts taken by KSWDC, the women tell us more on how this entity has changed their lives.